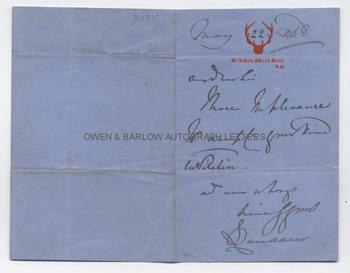 SIR EDWIN LANDSEER Autograph Letter Signed. British (English) artist. Known for his paintings of animals (such as 'The Monarch of the Glen') and for the sculptures of the lions that surround Nelson's Column in London. ALS. 1p plus integral blank leaf. St John's Wood, NW. May 22nd 1868. 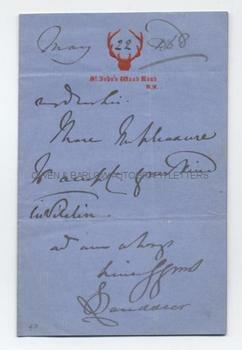 To "My Dear Sir". 16mo. 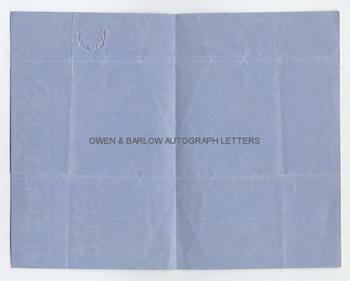 Approx 5.5 x 3.5 inches. Fine. One of the giants in 19th century British art, Sir Edwin Landseer was, and remains, an artist whose work has broad appeal across all classes. He is, today, perhaps best known for the lions which adorn Nelson's column, which were installed in 1867 - the year before this letter. He was, around this time, increasingly troubled by pessimism (which is now thought to be the result of a nervous breakdown) and in 1872 he was, at the request of his family, declared insane.